Whether you’re just starting out or a seasoned musical artist, every professional band can always use improvement. Successful bands can identify the need to always improve themselves, even the most famous bands stay on top of finding ways to improve. These improvements can be as simple as choosing to find a new rehearsal space or as extreme as letting go of the slacking member. Now that the new year is upon us, it’s the best time to tie up loose ends and work toward bringing your band to the next level. 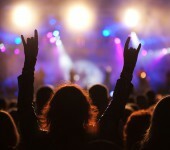 Most bands have been guilty of not rehearsing the flow of sets, causing awkward transitions and confused audience members. If you turn your back to the audience during a show and inform the members of what song to play, it comes across as unprofessional. A simple solution is to practice the flow during rehearsal, and go over the list right before the next show. Nailing the right pitch along with killer energy is what keeps the crowd going. Although energy isn’t something you can practice, harmony certainly is. By knowing the limits of your vocalists and fine tuning parts of the performance when other band members chime in, you’ll be able to achieve harmony. Using quality amps and speakers will take your band up a few notches and allow your music to sound richer. With today’s technology there are tables, iPads and musical apps that could help you achieve this goals. Other instruments like drums and guitars are not cheap but if you can make the splurge, do it. In order to improve your band it’s important to have a vision. This vision is what will allow you to set tasks, measure progress and stay on track. Perhaps your goal is to land more shows and gain more fans, this will start by practicing more, creating a band image and marketing the hell out of it. Communicating this vision to all band members and discussing goals will allow everyone to be on the same page. The best way to do this is have band meetings, assign responsibilities and make sure they’re getting done. Each performance should also be planned around this vision, if you take careful though into each show your fans will notice. After applying these improvements you’ll be sure to be noticing better quality sounds pumping out the speakers. Rapture Sound Studios provides the best music studio spaces on Long Island. We’ve built a sound studio for artists by artists, all sharing one goal, to create quality music. Make your new years resolution to improve your band and book a room now!